Peppa Pig Peppa's Deluxe House Play Set Just $25.53! Down From $40! You are here: Home / Great Deals / Christmas Deals / Peppa Pig Peppa’s Deluxe House Play Set Just $25.53! Down From $40! Peppa Pig Peppa’s Deluxe House Play Set Just $25.53! Down From $40! Right now you can get this Peppa Pig Peppa’s Deluxe House Play Set for just $25.53 (Reg. $40) at Walmart! 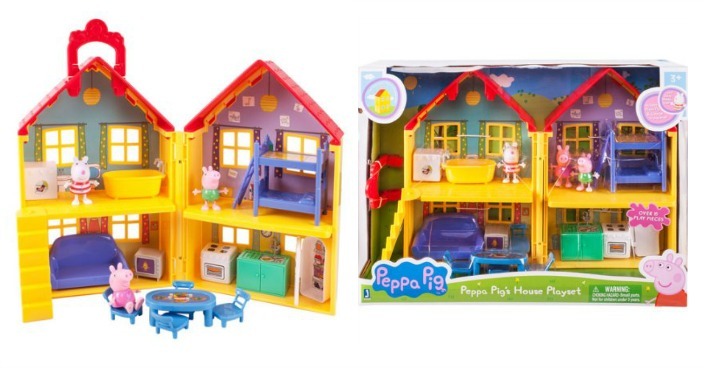 Kids will have a blast hanging out with Peppa and George in the charming Peppa Pig playhouse set! The playhouse swings open to reveal four rooms, complete with cute furniture for hours of pretend fun. Enter into the living room on the bottom floor and help Peppa and George kick back on the comfy couch for some fun TV time, or maybe they’ll cook up something delicious in the kitchen, which includes a stove, refrigerator and a sink. The upstairs bathroom even has a bathtub! Next to the bathroom is Peppa and George’s bedroom, where they can catch some Z’s on their delightful bunk beds. Peppa Pig’s playhouse includes over 15 play pieces, and folds closed when kids are done — there’s even a convenient carrying handle so they can take it on the go. Kids are always welcome at Peppa’s place!